We recently wanted to try something new and decided to take a walk on the Mile in Coral Gables, FL and check out a restaurant we had not tried yet. We walked in to Seasons 52! I loved it the minute I walked in. The atmosphere is great (which is typical in Coral Gables dinning scene). There is always a long wait if you don’t have reservations so we opted to try our luck at the bar where its first come first serve. The hosted indicated the option and off we went. We thought we were going to find a regular bar with stools, etc. Instead we found an oval shaped bar with stools all around and big enough of 3-4 bar tenders plus a piano and piano player inside it. I am usually not thrilled with live entertainment after a long day at the office since it tends to be loud and too lively. But here it is done in style. The music is usually smooth jazz and the tones are not intrusive. You don’t have to scream to talk to the person you came with. It was nice and mellow and I loved it. Then came the food. This is a fresh grill seasonal style American cuisine. The portions are moderate and very well balanced. The food is very fresh and tasty. I had a wonderful Apple Martini. The appetizers and wonderful, my very favorite are the flat breads. These are like long and very thin breads that are dressed with mushrooms, onions, cheeses and grilled like pizza would be. There is a variety of 4-6. They are all fabulous. 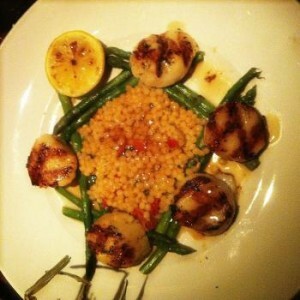 For dinner, roasted scallops with pearl past. Finally, totally delicious and guilt free desert. 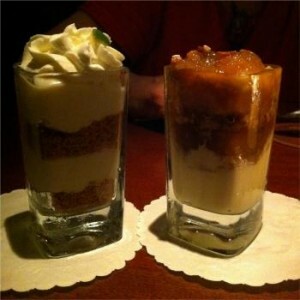 The mini desert menu includes items like cream cheese cake, peach cobbler, etc. 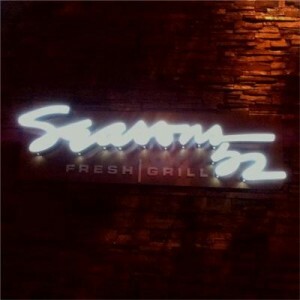 Within a month I had found an excuse to go back to Coral Gables and visit Seasons 52. A dear friend of mine had a birthday and I took her to dinner there to celebrate. A definite repeat and can not forget to order the flat bread! 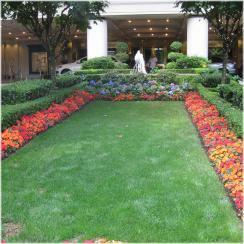 The Fairmont Olympic Hotel is within walking distance (approx 5 blocks) from Alaskan Way. A waterfront street with several seafood restaurants and souvenir shops. When we landed in the Seattle Airport, our shuttle driver spoke to us about the local attractions and also recommended a couple of restaurant. One interesting choice was one called “The Crab Pot“. It was great. This place is on the water. You can see the ships come in and out of the harbor and can hear the seagulls while you eat fresh seafood. This is a very low key place, suitable attire are jean or shorts and T-shirt. The menu includes various types of seafood, but the highlight of the place are the crabs. We had a dish called “crabs crabs crabs”. It is a crab boil, comes with Alaskan King, Snow and Dungeness crabs, red potatoes, corn and we asked to add a serving of Andouille sausage to the boil. Prior to your food being ready, the waiter places a thick white paper on the table (as one would a table cloth). He/she brings melted butter, lemon wedges, a mallet and a wood block to crack the crabs. There is also a basket of fresh bread served. When the crab boil is done, the pot is drained and its contents are poured over the white paper covering the table, in between you and your guest. We also ordered a pitcher of Manny’s pale ale (a local brew that is very nice on tab). The sea breeze, the seagulls, the view and good company, it could only get better if the rest of our family was with us! What an awesome time. A most definite repeat when I get back to Seattle, which I intend to do. I really enjoyed this city. The privacy of our visitors to is important to us at MnM Adventures. 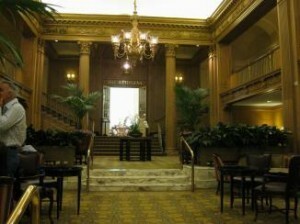 This is a luxury hotel filled with antiquities in downtown Seattle. We got a great deal through American Express Travel and paid all of it with American Express Reward Points. It is like stepping back in time. We had a luxury sweet filled with amenities for comfort. Our spacious room had two closets with iron and ironing board and a safe. The bathroom and dressing area was separated from the bedroom area. First, a vanity with plenty of space for dressing and a full length mirror adjacent to the closets. This area was separate from the bathroom and included a refrigerator with a wide selection of liquor i.e. wine, beer, champagne, hard liquor and various sodas. In the bedroom area, a comfortable reading chair with a step stool and reading lamp by a large picture window overlooking the downtown area. Within an antique armoire a flat screen TV. There was also, a desk with connections for internet access. The only downside we found was that WIFI was $15.75 a bit steep. The hotel has two exits on different streets given easy access to the downtown area. It is also connected internally to a restaurant, a wonderful french cafe, gift shop and various boutique style store. It’s central location in 411 University St, Seattle WA 98101. This makes it a great place for people going to or from cruises since the port is within walking distance. Being within walking distance to Alaskan Way means one can walk to excellent fresh seafood! We certainly enjoyed our stay and would welcome the opportunity to return to The Fairmont Olympic Hotel in downtown Seattle. A very nice very casual place. 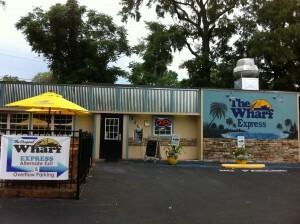 Standing back of the parking lot next to a convenient store, there stands the Wharf Express. With a wooden deck for outside tables and umbrellas and a welcoming sign with the daily specials. Inside you’ll find an eating bar with stools and a small dinning area with benches and tables. Running the place is John. A young man, who proudly displays and American flag next to the photos of his two babies (one around 18 months and one 3 months at the time of this writing). You have to order at the bar where he is also taking the phone orders for takeout. I think he has a pretty descent take out volume of orders. The menu has plenty of fresh seafood. You can order most of the dishes fried, broiled or blackened. 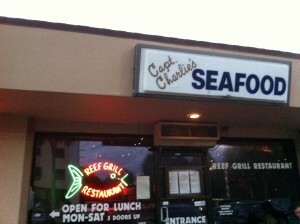 We ordered the blue crab fried with coleslaw and rice pilaf, also the seafood medley of catfish, shrimp and calamari. It all comes with freshly made hush poppies. The hush poppies are so fresh that my friend ate all of mine! She said she had not ordered them in years because everywhere else she went they were very greasy. Here they are excellent. Once you order at the bar, John comes to your table to bring your food. This is a disposable plate and utensils kind of place. They also have an assortment of various types of bottled beers and a limited selection of wines. John is very pleasant and eager to make sure you walk out with a positive experience of his place. And so we did, his food is very fresh. We asked for everything fried (we were on vacation…no diets!) and yet all of it was covered by a very light and well seasoned batter and NOT greasy at all. Well I was confused! Many years ago, I took my little girl of about 8 to the Universal Studios Theme Park. One time is all it took and we never returned. My girl is not the rollercoaster type (neither am I). She loved Disney World, Epcot and the Disney water park. She was not happy with all the rides that turn your stomach. Then I found King Kong ride and as we were making the line, when she heard the growls of the huge gorilla, she said “Mommy take me out of here!” and that was it! We left never to return, 20 years ago! All the time we have just gone to Disney theme parks where you at least have the option of getting your stomach place in your throat or not. 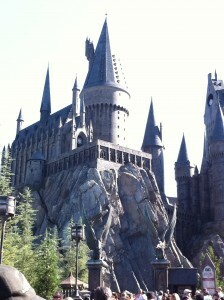 I love Harry Potter so when I heard the theme park opened with his exhibit I was dying to go. I immediately assumed it would be in Disney since I had heard it was in the Adventure place. The nuance of the Adventure Island and Islands of Adventure escaped me because I was not up with the Universal names. So when I was ready to go, I look up Disney’s Adventure Island only to find they had NO Harry Porter! 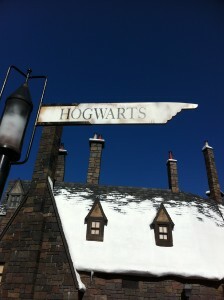 It was in Universal Islands of Adventures!!! Oh well I told myself. I guess is time to return to Universal. A disappointment… A friend had told me that the so called Harry Porter park was a relatively small place and would not take me a day to see, but just a couple of hours. I assumed a couple of hours because she does not care for Harry. I expected I would take double the time sifting through all the details. When I got there and found the ticket booth and got the map and found the place, (tucked at the back of the place), I was disappointed to find that my friend was right, no more than two hours to see what they have done with the concept. I should have known, Universal was more focused into turning my stomach than pleasing my eyes and hearing. The land escape is well done. Diagon Alley is well represented with all its shops. There is a nice candy store and the wand store and the typical souvenir place. You can even buy “butter beer” and “pumping juice”. Aside from the shopping, the options are four rides to make you seasick. The have a couple of roller coasters that you can see from outside the exhibit and two other rides that you can not see from the outside. All the rides come with several warnings: You have to be at least so many feet tall (about 4), no history of heart disease, no fear of heights, no resent surgeries, no motion sickness, no high blood pressure, no pregnancy, and the catch all or any other condition that could be aggravated by this ride or something like that. I was extremely disappointed that there was nothing to see, no ride that would display any creative, no motion picture segments, nothing other than the cautioned rides. At the end of my visit, I went into one of the shops to purchase a mug. The attendant asked me if I had enjoyed the park. I responded honestly that part of it was fine but there were no exhibits for me there because I do not enjoy rollercoaster. She asked if I knew there was a walking tour of Hogwarts! I was surprised and very happy and she gave me the instructions. “just tell the guy at the door of the Hogwarts ride that you just want the walking tour, he will let you in”. This was pure luck that I found this nice attendant that share this little known tour. I immediately went to Hogwarts and told the ride door keeper that I just wanted the walking tour. He was quick to point out what I should do and that I should go to the next ride attendant further down the path and say the same thing. (there were no signs that said anything about a walking tour). So I found the next guy and said the same thing and they opened one of the chained off areas for me to go through and told me to walk on the left side of the halls. I only found a couple of other people doing the same thing (who knows how they found out). The area where you can walk in is actually a few feet long. You can see Dombledore’s office, the hall where all the paining are moving and speaking to each other, and another area where they project moving pictures of Harry, Hermione and Rod talking to each other and finally running away. That area is well done and looks much like Disney’s hunted mansion where they project images onto screens so you can see people although you know they are not there. For me it was too little too late. I wanted more of that like in the Hunted mansion, where you actually sit on a ride that takes you through the mansion and shows you different things. Universal could have certainly done the same if they were no so obsessed with turning our stomachs. Unfortunately, I will not return to this park. Universal is not catering to the Baby Boomers but to the teens and X generation. We all loose. Not a repeat any time soon! I like the place with its country feel and its country store. My problem has always been that I find the breakfast too big and too heavy for my taste. I do not like biscuits and definitely not smothered with thick gravy…Just not my kind of food. I do have many friends that love the breakfast there and I do like the place and the store. So I wanted to find something that was more like my style of eating and I finally did! “Eggs in a basket”. That is my dish! I had never seen this. They use two sourdough bread toasts and make a circle hole in them. In the circle the fry one egg for each. Mine were over easy and they were perfectly done. You can hold the toast up gently and the egg stays tucked in the whole in the middle of the toast. It is very nice with bacon or country ham. This gem is hidden in a small shopping mall off of US1 in Juno Beach. You can’t see it from the highway but the locals sure know where it is. We went early (6:30p) on a Sunday afternoon and it was hard to find parking. The place was filled and they took our name and told us the wait was about 20 minutes. They pointed us to their smaller location a few door down in the same mall where they serve lunch and have a bar. The wait was actually shorter than that and we took our draft beers over to the restaurant. We had agreed to sit at first available (which includes the bar in the larger restaurant). We were seated at the bar on the side that has the open kitchen. At first I had doubts about sitting there since a little bit of the kitchen heat kind of spills over to the eating area, but we decided it would be interesting to watch the cooking action. That proved to be a great idea. If you are into cooking, those are the best seats in the house. Those cooks are awesome. They are fast and know their stuff. It is impressive to watch them cook 3 or 4 dishes each at the same time. There were a few of them. From where we were seated we could see two perfectly, but knew there was a couple more down the isle. The place is booming. The owners were part of the serving crew. The service was good and the food was better. We decided to have a few appetizers so that we could taste a few of the dishes. We had grilled scallops, fried calamari with marinara sauce, and the tuna spring rolls with a spicy soy sauce. For desert a wonderful Cream Brule and a multiflavor home made ice cream that had ginger and mango and something else very fresh and tasty. There were many pasta dishes, oysters, shrimp, fresh fish that we actually saw being prepared. The many has more than 100 different items to choose from. Have you ever had it happen to you that you enjoy a wine during a meal and write the name down so you can order it next time. You expect to like it next time, but during the next meal you wonder why you thought you like it before??? Is all about the paring! Yes, the paring! The combinations of taste that happen in your palate when you mix wine with a meal. It can change everything, and it seems to me (not a wine expert, obviously) that some wines are more susceptible to these changes than others. I have learned the lesson and from now on I will try to write not only the wine but the food I had when I drank the wine. It most be said, however, that for those times when you are just drinking wine with cheese and grapes or any other appetizer in an informal gathering, I found a few that I like and want to keep them here for future reference. These seem to stand the test of food variations, at least for me. We had an overnight stay in Tallahassee and decided to have sushi for dinner. I usually go to TripAdvisor.com to find the local places when I am in a new place. 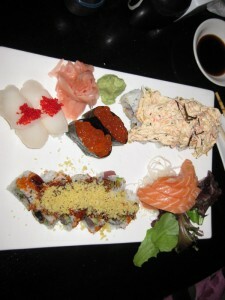 This time I found a few Sushi places among them Masa Restaurant. We almost missed going because there was a review that was not too good. I consider myself a Sushi connoisseur. So when I read the Masa Restaurant review from someone who presented himself as a very picky sushi eater, I gave it more weight than I should have. But there were others very happy with the food and since we really wanted sushi that night, we decided to risk it (or so we thought we were doing)! Nothing further from the truth! Masa Restaurant is a very nice restaurant in Moore Street Tallahassee. 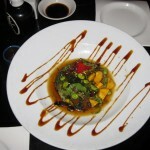 They serve food from a variety of cuisines, so if Sushi is not your thing, you should still try it. The table next to mine had a couple of stakes that looked delicious! If you do like Sushi, this is a good place. We had an appetizer that I am already craving although I live many many miles away! It is called Mango Poke. If you go, don’t miss out on this one. It is served as a salad in a plate that is a bowl in the center with a large lip all around (shown here on the left). On the lip, they streak eel sauce. In the bowl, they serve a combination of the following: Fresh Tuna in chunks, fresh mango in chunks, seaweed salad, a little bit of field greens, edamame, dressed with what I think was kimchi sauce. To die for! We ordered a couple of roles, nigiri scallops, eel, ikura and a few pieces of Salmon sashimi. Everything was very fresh. The service was very good and prompt. We were stuffed and could hardly order desert so we ordered a type of mango mouse that was very light and good. The ambiance was entertaining. There were tables with all suited men (probably the local politicians and business men). Also tables with parents and students and some just with students. Behind us was a large table with a big family gathering from “grandpa with white well combed beard” to little kids. In all Masa Restaurant is a very busy and lively place with many young waitresses walking quickly back and forth making sure everyone of us was taken care of.